New Year Bonanza: Indian diamond merchant gifts 1200 more cars to his employees! 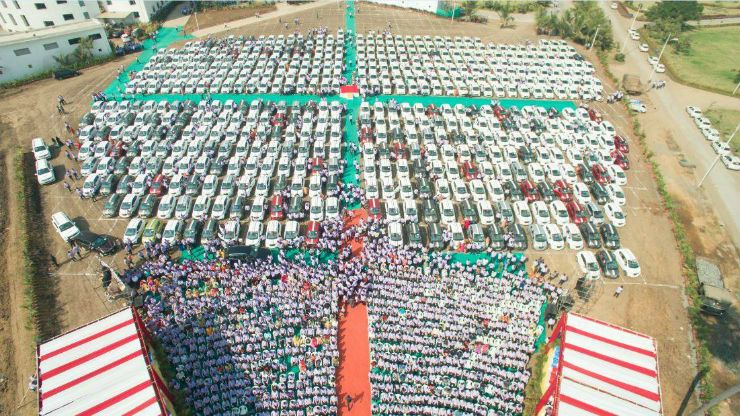 New Year Bonanza: Indian diamond merchant gifts 1,200 more cars to his employees! Remember the famous Surat-based diamond merchant who showers his employees with cars, flats and expensive gifts every Diwali? He’s back. Savjibhai Dholakia, the owner of Hare Krishna Exporters, just rang in the new year with a whole load of gifts for his employees. As a bonus to his employees, Savjibhai gifted 1,200 units of the Datsun Redi-Go hatchbacks. Savji is known for generous gifting every year. During Diwali 2016, Savjibhai gifted 1,260 vehicles from Maruti and Datsun to his employees. Before this event, the owner had gifted 491 Fiat Punto as a bonus. This time around the bossman gifted 1,200 units if Datsun Redi-Go as a bonus. 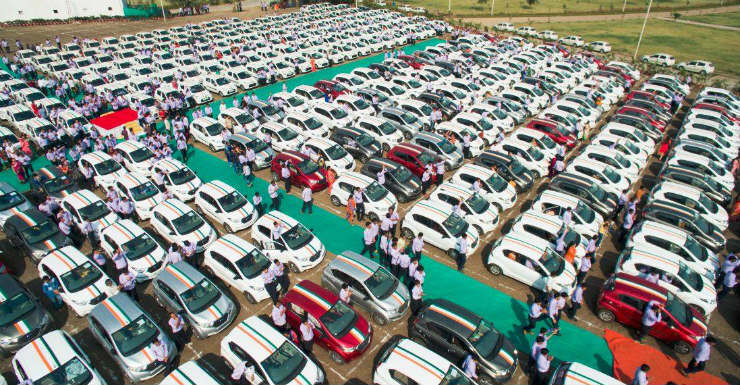 The gifted Redi-Go cars came with Indian tri-coloured stripes across the body of the vehicle.The grand ceremony was held inside the premises of the diamond exporting company. Only the employees who have no received any such bonus in the past were eligible for the new gift. Savjibhai pays the down payment of all the cars, and the vehicles are taken on a loan for five years. The company will also pay the monthly installments for the cars, but all this comes with a caveat. If any employee who’s received the car parts ways with the firm within next five years, the EMI will be stopped. Datsun Redi-Go is a stylish hatchback from Datsun that comes with a 0.8-litre, 3-cylinder petrol engine that churns out a maximum of 53.2 BHP at 5,678 rpm and 72 Nm of maximum torque at 4,386 rpm. The car comes with a 5-speed manual transmission. While there’s no automatic transmission available with the vehicle yet, Datsun has plans of launching a bigger engined Redi-Go with a 5 speed automated manual transmission. This engine-gearbox combination is already available with the Renault Kwid, a car with which the Redi-Go shares parts and the production facility. Savjibhai also gifted few other gifts like flats and jewelry to the employees along with the cars. Dholakia started the trend in 2013 when he gifted the Chevrolet Beat vehicles to the employees. Savjibhai Dholakia is a very known personality in the city of Surat. He is called ‘Kaka’ by his employees. Hare Krishna Diamond Exports has a sprawling business spread over 71 countries, and the annual turnover is said to be more than 6,000 crores annually.All said, now who wouldn’t want to earn a car as a bonus? It is as extravagant as it can get.